Obvious choices for the unknown roles are the two women seen frequently with DeLisle, Harmon Meyer the city Hall rep, and Brenda the concessions lady. I have no idea who played Jimmy D--for all that his name came up all the time, he was never satisfactorily explained. Elliot gets to direct a commercial about Philadelphia for City Hall; panic and insecurity ensue. Elliot and Ethan are stuck in horrible traffic, but they make it home to Nancy who is getting over a round of chemotherapy. Ellyn asks D.A.A. to do a public service announcement about Philadelphia youth, so Michael and Elliot put their heads together and it sends Elliot into paroxyms of ecstasy coming up with ideas and begging Michael to let him direct. Nancy is supportive of his efforts. The city hall people and D.A.A. have a huge pow wow and Ellyn pulls Michael out, expressing her sincere concerns about Elliot, but Michael backs him up. Elliot works hard (even calling people at C.A.A. 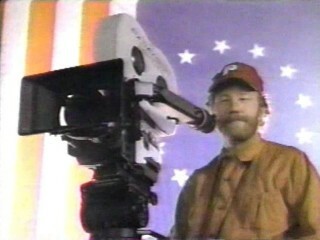 on the West Coast) and manages to land Ron DeLisle, a famous actor and native of Philadelphia, for the spot. The City Hall people continue to express some concern that the spot is losing simplicity. Ron DeLisle shows up and makes Elliot look very good. Michael gets rid of his desk and moves everything to the pool table surface. Miles stops by to express his own concern, which means that Michael has to go and talk to Elliot about staying inside his bounds. The night before filming, Ethan asks Elliot what the director does on the set and somehow this sends Elliot into a tailspin. The next morning, Elliot completely freaks and Michael can't calm him down. They meet a concessions worker named Brenda who knew Ron DeLisle and asks them to say hello for her and deliver a phone number. There is much extended work on the set which leads to confusion and running over time. Meanwhile, Ron sits around, twiddling his thumbs, gets upset, leaves, and even Miles shows up to express displeasure. Elliot realizes that the first day went horribly and gets quite drunk that night, but Nancy tries to cheer him up. The next day goes much the same, with everyone watching on and Elliot overdirecting to Ron, who continues to twiddle his thumbs. After Elliot makes Ron do eight million takes of his one line, Ron blows up and rakes him over the coals quite harshly. Ashamed and embarrassed, Elliot doesn't put up a fight, but remembers at the last moment to tell Ron that Brenda said hello and gives him the phone number. This affects Ron profoundly and he agrees to one last take. When the spot is done, the group invites Elliot to come watch it in the screening room; he walks there slowly to the music of 2001: Space Odyssey. Miles likes the piece very much and everyone is proud of Elliot. Stuck in traffic on the way home, Nancy says how nice it was that Elliot had not been afraid to need her for the first time since the surgery. The episode closes oddly with a motorycle cop leading them out of traffic and a number of seemingly significant but incomprehensible symbols (e.g., a woman walks by carrying a bunch of balloons in the same colors as those used in the commercial spot) go by as Elliot himself descends into the frame on a director's crane. Elliot wears a jacket pin shaped like a motorcycle and another shaped like a wreath. Nathan Olson wrote to observe-- "In one scene when they're getting ready to shoot the Philadelphia PSA, someone puts up one of those scene things (the thing with the hinged piece of wood that shows the scene number; what is that damn thing CALLED?) -- instead of reading D.A.A. or whatever on it, the "scene thing" actually says "thirtysomething"; I think upside down." This has in fact been confirmed and there's a screen capture of it up at Bob Fahey's page. The missing scene is right after Elliot comes home drunk and talks to Nancy. The next scene shows Elliott in the kitchen of his home eating at the counter, still in his clothes from the day before and the sounds of morning are outside. Ethan walks in and tells Elliot he tried to talk to him the night before but said he fell asleep. He asks Elliot if he had fun the day before, to which Elliot responds "Yeah, it was a riot." Ethan says his mom is going to bring him to see his dad that day. Elliot says, "Gee, I don't know you might get bored." Ethan responds, "I won't get bored". Elliot says "Yeah, you're right, I gotta go." Ethan says, "Just don't put that dumb liberty bell in the commercial," and Elliot responds, "Yeah, ok", and kisses Ethan, and walks to the door. Elliot walks outside his house and finds Michael on his front porch. He says, "You scared me, man", and Michael says, "I'm driving you in so we can go over your shots today." Elliot responds, "The hell you are!" Michael replies, "Elliot, don't fight me on this, all right. You're putting everybody on the line here." Elliot responds, "I'm not putting anybody on the line, I'm getting the job done." Michael responds, "I've gotta make sure of that". Elliot says, "Listen ,Michael, why don't you tell Miles you tried to rein me in, that way your conscious will be clear, and he won't fire you when he fires me." [Elliot is mad.] Michael, backs down and says, "Elliot....". Elliot looks at him and says, "Take a hike Michael". He leaves Michael on the steps and walks away. Michael looks hurt and concerned and the scene cuts to the front of the courthouse. Melanie Mayron gets to direct her first episode and it is reflected somewhat by the fact that she only shows up for one brief instant on the screen side. I'm not sure what to do with the final scene. The music was like something out of The Stuntman and it seemed as if there was some symbolism in the motorcycle cop's appearance. Ther was also a woman with a bunch of yellow, blue, and pink balloons in a corner of the screen, which might be a tie-in with the use of yellow, pink, and blue balloons in Elliot's spot. [4/29/99] TJ Lynch has saved the day with this insightful analysis of the references and in-jokes! 1. Opening and closing sequences: Parodies of Federico Fellini's 1963 Italian movie "8 1/2". That movie deals with a movie director (Marcello Mastrianni) who is suffering an extreme creative block. The movie opens with a surreal dream sequence of the director caught in a terrible traffic jam with some rather grotesque fellow travellers looking on. (Other homages to this scene that I can think of are in Woody Allen's "Stardust Memories" and mayyy-be the R.E.M. music video to "Everybody Hurts".) The closing Italian circus band march that accompanies Elliot's dream apotheosis as a *DIRECTOR* is also from "8 1/2" (Nino Rota, composer). Other Fellini like touches include the girl with the balloons, and a relatively large number of long distance shots (like Michael and Miles conversation after the first day of shooting). ...I caught some of the Disney TV movie fantasy "Toothless", directed by the director of "going limp", one Melanie Mayron. The plot has Kristie Allie dying and finding herself in limbo in the Next World. Apparently she has to redeem herself by coming back to Earth as the Tooth Fairy (don't ask me why). Many of the scenes of the next world are, well, Felliniesque. 2.Elliot, when excited by the prospect of directing, starts babbling and throwing out movie and movie director's names. Among them are Ed Zwick's "Glory". 3. There are 2 montages of Elliot making the commercial. The first one has a musical score of the "Colonel Bogey March" from "Bridge On the River Kwai," directed by David Lean, one of the directors Elliot mentions. The second one is accompanied by The Champs' "Tequilla." I'm not sure why, unless it's an homage to Tim Burton's "Pee Wee's Big Adventure." But I love "Tequilla" so I won't complain. 4. Elliot enters the screening room in slow motion, accompanied to the stirring strains of "Also Sprach Zarathustra" by Richard Strauss, made famous again by Stanley Kubrick in "2001: A Space Odyssey". I am not certain but I think this sequence is a shot for shot replica of the docking of the space ship in "2001". 5. I don't know this one, but when Elliot and Nancy, excited by the prospect his directoral debut, start flirting, they are accompanied by some slightly cheesy romance music. It sounds French-pop to me, so I'm going to guess it's from "A Man and a Woman." I think this was Melanie Mayron's first directoral venture ever, and since this was about someone making their directoral review, I think it had extra special meaning to her. The direction has a certain flashy, "look at me" quality, that I thought worked quite well. After "I’ve got it under control," Elliot adds, "Look at these cards." Michael: Great, the colors are fantastic. Work with Jimmy D., Elliot, he’ll help you out. Elliot, angrily: I don’t need anyone to help me out. 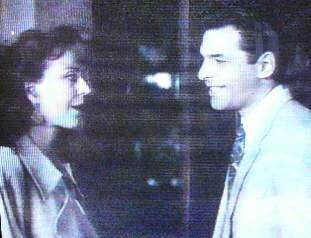 In the next scene, Ellyn is about to leave the Steadman home, Michael sees her out. It’s dark out but there’s no way of telling how late it is or why she came over to the house in the first place. Ellyn: Just tell me it isn’t a train wreck. Michael: It isn’t a train wreck. You’ve seen the cards. He’s prepared. Ellyn: Alright, but you’ll always be there to hold his hand. Michael: I’ll always be there to hold his hand. Ellyn: Ok, but maybe I’d better call him. Michael: You don’t need to call him, everything is going great. Ellyn: Ok. (Moves out the door, turns right on her heel) I’ll call him. Michael: No, don’t call him, you’re not responsible anymore. Elliot and I are, particularly Elliot. You can come and watch tomorrow if you like. Ellyn, angrily: Stop making fun of me. Michael, smiling: No, come watch, you’ll like it. (With his inimitable Michael smile:) It’s like Hollywood. Ellyn: Goodbye. (He shuts the door behind her). Ellyn (to herself): It’s a train wreck. Michael (to himself): It’s a train wreck. Is it a train wreck?